"Browning the butter really adds a depth of flavor, not to mention it smells extra amazing when in the oven. This is my go-to recipe when I have ripe bananas, and has taken me a while to get it right. Enjoy it hot, fresh from the oven." Melt butter in a small saucepan over medium heat; bring to a low simmer and cook, stirring frequently, until butter is browned, fragrant, and foamy, with brown bits in it, 5 to 10 minutes. Set aside to cool to room temperature, about 15 minutes. Measure 1/3 cup of browned butter; reserve remaining browned butter for another use. Mash bananas in a large bowl; stir in brown sugar, white sugar, egg, vanilla extract, and 1/3 cup brown butter. Whisk flour, baking soda, cinnamon, and nutmeg together in a bowl. Fold flour mixture into banana mixture just until all ingredients are moistened; pour into prepared pan. Bake in the preheated oven until a toothpick inserted near the center comes out clean, about 45 minutes. 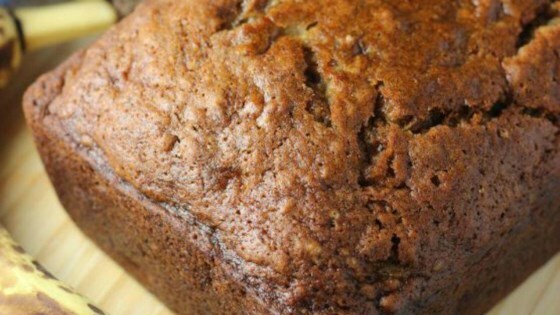 Enjoy this simple banana bread fresh from the oven! Don't skip the browning step - it really adds depth to the flavor. Chocolate chips, nuts, or whatever else you enjoy can be added in. Nutrition data for this recipe includes the full amount of butter. The actual amount of butter consumed will vary. Browning butter will reduce the volume somewhat. For this reason, you begin with 1/2 cup butter, and measure 1/3 cup butter after the browning step. Very similar to my recipe - amazing what a difference such a little tweak made! I'm sticking to this variation henceforth! Browned butter really makes a difference! Only used nutmeg and the flavor was fantastic. Used the "leftover" butter to oil the pan and added sugar in the raw to make a nice crispy crust.